Like the summer, the Los Gatos Food Fest is coming to a close for the year. 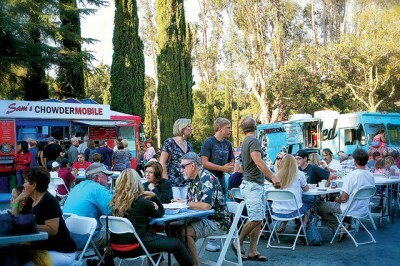 The event has been bringing beer, wine, live music and, of course, food to a woodsy spot in Los Gatos—the lot in front of La Hacienda restaurant and hotel—every Friday night since May. Every week there’s a different live band and a rotating lineup of Bay Area food trucks. One recent edition of the event featured the Waffle Roost, Sam’s ChowderMobile and Oaxacan Kitchen Mobile, among other trucks. Country musician Erica Sunshine Lee performed. Theron Kagnoff, manager at La Hacienda, runs the event. He says he likes the way it brings people together to enjoy themselves. Kagnoff says that even though the season is winding down, the Food Fest still draws between 600 and 800 people every Friday night. “It’s a great place to bring the kids, it’s safe, it’s well organized, there’s really not a weak link in the entire chain,” says Kagnoff. Justin Funamura, owner of the Waffle Roost food truck, says he has the same feeling about the Food Fest. The Waffle Roost, which has been in operation for a month and is headquartered in San Jose, has attended two of the Food Fests this season. It will be held for two more Fridays this year, with the last one of the season happening on Sept. 27.